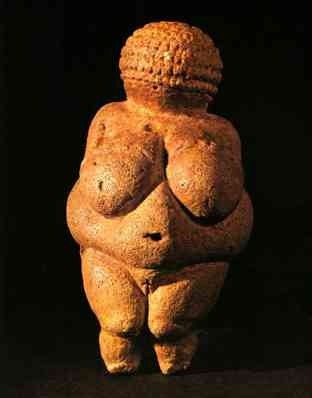 This Figure is quite well known, the “Venus of Willendorf”. It is the most commonly used symbol of prehistoric carvings and sculpture, I’ve seen in several classes throughout the years, museums and documentaries show something similar when explaining art in the pre-history times. So I was not surprised to find a section on her in my current Art History text book. However the story attached to the photo was slightly different this time. When the statue was first discovered, archeologists had been finding quite a few of these female figurines through out Europe. They called them “Venus” statues. This particular one was found near Wallendorf, Germany and is thought to have been carved around 26,000 years ago. Because one scientist referred to these as Venus statues, the interpretations of what they might symbolize was warped. Venus was the Roman goddess of love, beauty and fertility, using her name for these statues implied that they had a religious connotation of some kind, and representing the ideal of womanhood. For years, these figures were thought to be fertility figurines, representing the Mother goddess figure, even though there was no proof. I remember this being the theory I was taught in junior high. However, new research has moved away from this bias and tried to determine the truth without being swayed by an artificial name. There were two theories in the book that I found particularly compelling. The leading Theory (Clive Gamble), states that these figurines were a form of non verbal communication, some kind of peace token between two tribes that wouldn’t know how to communicate with speech. As symbols these figures would have provided reassurance about shared values about the body, or technique and the small size of these figurines (about 4 inches tall) would have demanded a face to face, close contact in order to exchange them. The other theory expressed here (from Leroy McDermott) focuses on the exaggerated form of these female figures. they have bulbous extreme proportions and very few have any feet. He argues that the perspective was that of a pregnant woman looking down on herself. This was quite an exciting theory since this would show the origins of female art and offer an intriguing insight of women as artists, in charge of how they were represented. Quite fascinating when we think about the power of a Name, what it means to us and what it then becomes because of it. It is a Human Universal trait to name (people, places, things), to attribute a sound (audible symbol) to represent something else. But it’s in the interpretations that every culture differs.